Article New Intel 28 core unlocked Fire breathing monster review ! With a mild oc like 4GHz the power might be around 330W which is not that bad considering power for 9900k/2700X for 8C/16T or TR. But for desktop it is too high. 380W at stock with Povray but only 330W once mildly overclocked.? Pretty excited, just got my hands on a sample. Pic attached. The discoloration is normal I'm told. How come the graph above shows power for 60+ threads when this thing only has 56 threads? "On the power side of the equation, again the W-3175X comes in like a wrecking ball, and this baby is on fire. While this chip has a 255W TDP, the turbo max power value is 510W – we don’t hit that at ‘stock’ frequency, which is more around the 300W mark, but we can really crank out the power when we start overclocking. This processor has a regular all-core frequency of 3.8 GHz, with AVX2 at 3.2 GHz and AVX-512 at 2.8 GHz. In our testing, just by adjusting multipliers, we achieved an all-core turbo of 4.4 GHz and an AVX2 turbo of 4.0 GHz, with the systems drawing 520W and 450W respectively. At these frequencies, our CPU was reporting temperatures in excess of 110ºC! This processor is actually rated with a thermal shutoff at 120ºC, well above the 105ºC we see with regular desktop processors, which shows that perhaps Intel had to bin these chips enough that the high temperature profile was required." Does TDP mean anything at all any more? Did Intel just give this a TDP of 255W because the ARK database only assigned that field one byte or something? Just wait for its successor - Cascade Lake-AP with unlocked 48-56 cores. 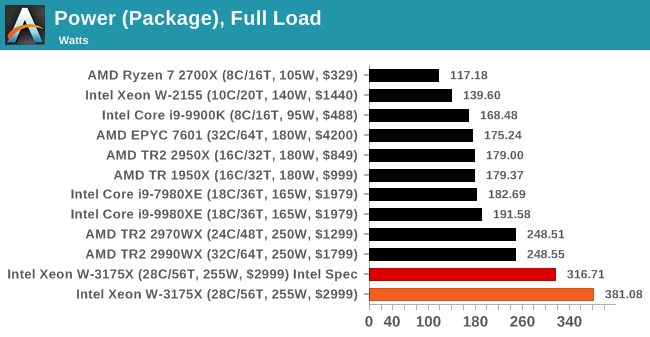 Cascade Lake-AP should come in at better overall perf/watt due to lower overall clockspeeds. Unlike this chip, which is an enthusiast's toy, Cascade Lake-AP is expected to do grunt work in server rooms. It needs to provide an acceptable TCO. Personally I do not see any reason for this processor. Maybe there are some oddball circumstances where you need 28 cores localized to one socket running at relatively-high clockspeeds. A lot of software that's sufficiently-parallel to run over 28 cores, regardless of the socket config, can be made to run acceptably well on multisocket systems or even on small, cheap clusters. Normally, we wouldn't expect such a chip to be overclocked in commercial use, if anyone would buy it for it's normal intended purpose. Those who would be buying it to overclock it, would already know what they are getting into. A 32 phase power with 6 CPU power plugs, and 2 24 pin power plugs just for the motherboard. At 4.4 ghz with a custom water setup, it consumes 510 watts just for the CPU ! How much power does your TR2 2990WX pull when overclocked to 4.3 GHz (All--Core-Overclock) on watercooling? Never mind while registering 110c core temperature, oh, and 6 channel memory controller. Why do you even bother creating these threads with flame-baiting titles, especially when it's so clear you're pro AMD? Yes, we know you own Intel systems (that's your go to line when you get called out) from a period when AMD was woefully uncompetitive so save us the headache and just show your 2990WX with better power consumption numbers while overclocked to 4.3GHZ, will ya? Seriously, how did Intel persuade Asus and Gigabyte to make motherboards for this? Has Intel payed for these? Or have these two companies co-developed them to lower costs? I have not compared these motherboards to see how much they are similar. I think the GN review said the boards cost around $1,700 themselves if I recall correctly, so there's apparently a lot of markup involved because it is such a small run of parts. How much different is it than one of the multi-socket server boards as far as difficulty to build? @Zucker2k : FYI, a TPU user claims his 2990WX pulls 850W sustained over @ the wall, but that's with the CPU @ 4.2 GHz, and claims it peaks higher ofc. I'd expect the consumption to be a bit higher if @ 4.3 GHz. Dunno temps, but he was asked in that thread (hasn't replied, yet). It does not seem to be fair to compare 2990WX, which comes from "one of the better bins" and is available widely in high numbers, with W-3175X, which comes from "the best of the best of the best bin" and will be available in negligibly low number and probably will be never sold to end customers. 2990WX is just a normal mass consumer market cpu, while W-3175X is a UNICORN cpu. Actually I think that Intel should have gold plated the heat spreader. It does not seem to be fair to compare 2990WX, which comes from "one of the better bins" and is available widely in high numbers with W-3175X, which comes from "best of the best of the best bin" and iwill be available in negligibly low number and probably will be never sold to end customers. 2990WX is just a normal mass consumer market cpu, while W-3175X is a unicorn CPU. Well, the Xeon is built on an aging 14nm process, with which Intel has gotten unbelievable mileage. 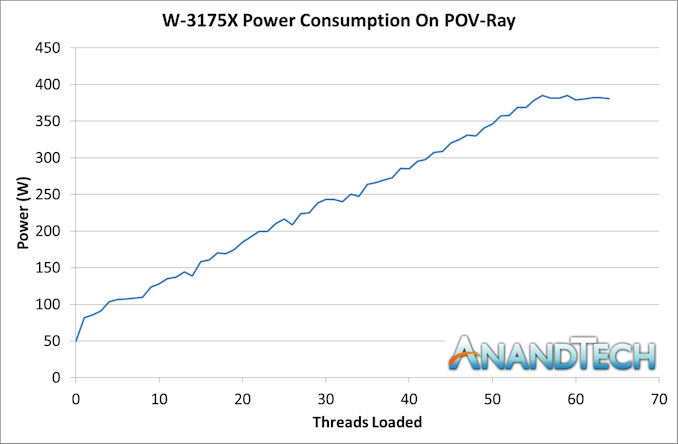 2990WX is built on a new 12nm process. Seriously, how did Intel persuade Asus and Gigabyte to make motherboards for this? Has Intel payed for these? Of course Intel paid them - no way would 1500 sales cover the cost. What the hell, somebody reported my post, was somebody insulted because I called that CPU a unicorn cpu or what?! you create a post in moderator discussions. The most I have ever seen it draw is 350 watts. I don't remember what speed that was, but I think it was only 4.0 and it was 75c, not 110c. For 4 more cores this is way better than thats POS @ 510 watts. As far as why I created it, it was the Anandtech front page article yesterday, so I linked it. The the "fire" came from their own conclusion, not mine. I don't care what he said, thats neigh onto impossible, the motherboard can't supply 700 watts (he said -150 for the rest of the system, but no system details). It would melt first. Why do you think the motherboard in this article had 32 phase power, and 6 CPU power strips, and 2 24 pin power pins ? 510 watts need that. 700 watts on even a 19 phase MSI board ? I don't think so. I don't care what he said, thats neigh onto impossible, the motherboard can't supply 700 watts (he said -150 for the rest of the system, but no system details). It would melt forst. Why do you think the motherboard in this article had 32 phase power, and 6 CPU power strips, and 2 24 pin power pins ? 510 watts need that. The dude didn't elaborate on what was running that was using that much power. Perhaps whatever the workload was much intensive then what you personally use? For all i know, he could have been talking about Prime95 small FFTs: that could explain the very high power draw, no? The only thing that could explain 850 watts IMO, is 2 1080ti cards doing something at full load. My 1950x systems with CPU and both GPU's fully loaded draw 700 watts, so 850 would be about right if I substitute a 2990wx.. Except overclocked, maybe one 1080ti fully loaded and that CPU. But by itself, 700 watts would literally blow the motherboard, at least any motherboard currently made. What could explain this measly 511w @ 4GHz then? I don't have specifics on what he had in this particular system but, judging by the "150W to the rest of the system", i'd say he's not using 2 video cards: you'd have to ask him for more details. To be clear, there are likely hundreds of threads running on your system at any given time. What multi-core processors allow for is x-number of threads to process simultaneously. They could load up 100 threads in their test app, but only up to 56 would be getting processed at the same time (fewer in reality when you consider background system tasks). Did you get a system message to say one of your posts had been reported? This is something that is not discussed openly in the forums. create a thread in moderator discussions. Needs custom cooling with 1-2kW rated capacity. For OC 5+ kW needed. The numbers sound inflated because they are. Most "enthusiast" grade gear aims for much higher deltas. Coolant temperature needs to be at ambient or at most 2C above ambient and NO MORE! Otherwise, you're just undersized. (and inadequate by a LONG shot!) Look at the tests, > 105C under load. I like setting the bar high. 5GHz fully loaded AVX512 for 90 days with a proper solution (glycol system with blocks on VRM parts as well). And let's not forget the $500/mo. power bill just for your 28 core system. It looks interesting but no end user availability is a deal breaker for me. And TBH, if I had the NEED for 28 cores per socket I'd just buy a four way system and toss in four 8180s and be done with it. Along with 1TB RAM per socket. 512GB is OK for a workstation but I'd rather see 1TB supported since this is considered "high end". Intel's TDP is a bracket number * for the cooling dissipation needed to get the base performance of the CPU(short boosts included) ,never ever and nowhere does anybody of authority state that TDP is consumption. *bracket as in it covers all CPUs of a tier,which is why you will see things like the G3930 2c/2t 2.9Ghz having the exact same TDP as the G4620 with 2c/4t 3.7Ghz. I measure from the wall. Using a known base for the system, and going up as I load it. I don't know how they measure, but even if so, its not at 110c and its 4 more cores and 8 more threads. Its also possible that I am underestimating the uncore. Could Intel or AMD put ray tracing cores on a CPU die?